Congratulations to Brian Hastings, Winner of Event 12: $10,000 Heads-Up No-Limit Hold'em ($371,498)! 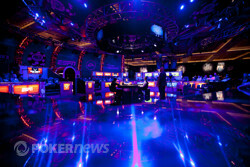 We began Event 12, the $10,000 Heads-Up No-Limit Hold'em, with 152 players. After 151 matches, only one emerged with an undefeated record. 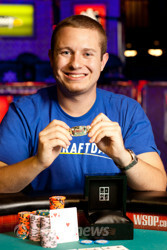 24-year-old Brian Hastings outlasted the field, capturing his first World Series of Poker gold bracelet and a $371,498 pay day. Known for his high-stake online cash-game wizardry, Hastings has certainly made his mark in the live poker scene with his triumph. Hastings received a bye in the play-in round, automatically sending him to the round of 128. There he defeated James Rumptz and earned a spot in the round of 64. After defeating Emil Patel, Hastings not only earned a spot in the round 32, but also guaranteed himself his first WSOP cash on American soil. On Day 2 he faced three opponents and one by one he took their chips. It started with a victory against Tommy Vedes after Hastings sprinted to a sizable lead. On the final hand, Hastings' held up against Vedes' to set up a match with Amritraj Singh. His longest match of Day 2, Hastings defeated Singh after the two got their chips in the middle after a flop. Hastings held for a flush draw against Singh's for a weaker flush draw and top pair. It wouldn't be a queen or flush that won it for Hastings, but rather the turn and river that gave him trips to earn a seat in the elite eight, where he faced Jeffrey Gross. Despite finding himself down 4:1 in chips at one point (with one lammer behind), Hastings recovered to defeat Gross after the latter committed his last chips with . Hastings called with and punched his ticket to he final four when the board fell . His Day 3 went about as smooth as possible. At no point did he have to use either of his lammers in his final four match against Tommy Chen and championship match against Jason Mo en route to his winning the bracelet. Within minutes of his match against Chen, Hastings took Chen's first buy-in and it wasn't long before he took the second. From there, Chen battled back with his last lammer to take the chip lead. However, Hastings doubled up with when it held against Chen's all in preflop. He closed out the match shortly thereafter with against Chen's all in preflop. The board ran out to pair Hastings' ten and give him a shot at winning the bracelet. His final match against Jason Mo was mostly a one-sided affair. After falling behind in chips immediately, Mo used one of his two remaining lammers and cashed in his last one as his chips began to dwindle again. Just like the match against Chen, Hastings saw his chip lead disappear briefly before doubling with against Mo's . The match ended the following hand when Hastings shoved on the button with and Mo called all in with from the big blind. The final board came down , securing the victory for Hastings. Congratulations to Brian on his amazing accomplishment! It's all over! Jason Mo just lost back to back all ins, and with that Brian Hastings will take home his first World Series of Poker gold bracelet! 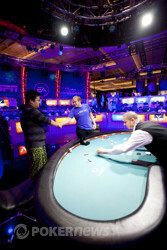 From the button Jason Mo raised to 160,000 after which Brian Hastings three-bet to 400,000. Mo asked for a count of Hastings' stack and he had right around 1.9 million left behind. Mo moved all in having his opponent covered and Hastings called right away. The flop brought out and didn't change the situation. The on the turn hit Hastings but Mo picked up some outs with his flush draw. Unfortunately for him the river was the and Mo was left behind with just 430,000 chips. On the very next hand Hastings put his opponent all in from the button and Mo made the call. The board ran out giving Hastings the winning hand, the knockout and the bracelet! 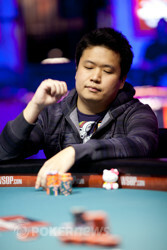 Jason Mo finished in second place which gave him a $229,722 pay day. Brian Hastings will take home the top prize earning him $371,498. From the button Brian Hastings raised to 120,000 and Jason Mo defended his big blind. The flop came down and both players checked. The turn was the and Mo lead out for 150,000, and he got called by Hastings. The river was the and Mo bet 375,000 into Hastings who opted to make the call. Mo showed for the wheel and he is now up to 3.13 million while Hastings has 1.99 million left. Hastings still hasn't used any of his rebuy lammers. Jason Mo raised from the button to 120,000 and Brian Hastings put him all in once again. Mo called for a total of 1.32 million and we got to see another all in showdown. The board ran out giving Mo a pair of queens and a much needed double up. Mo is up to 2.64 million while Hastings has 2.48 million with two rebuy lammers behind each worth 1.28 million. 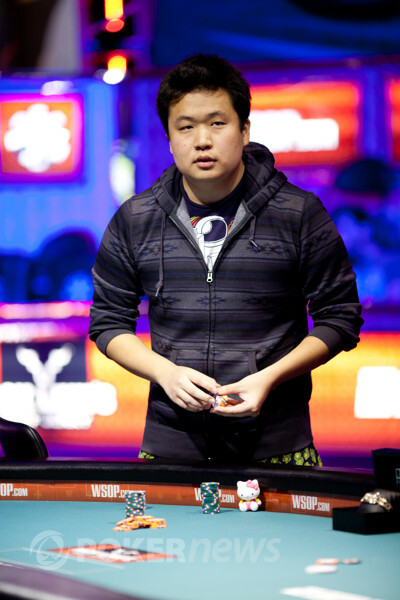 Jason Mo was just all in for his tournament life, but he was in good shape to at least chop the pot. From the button Mo made it 120,000 and Brian Hastings put him all in for right around 900,000 chips. Mo called and we got to see the following showdown. The board ran out giving both players the same hand and this pot was chopped. "Brian, make it fast, we're missing hands!," some friends of Brian Hastings just shouted from the rail. Hastings started laughing after which he got brought back into focus by Vanessa Selbst who said, "Stop laughing. Eyes on the prize." Brian Hastings has a big lead over Jason Mo but this thing isn't over till he has won all the chips! We caught the action on a flop when Brian Hastings check-called a 150,000 chip bet. The river was the and Hastings checked again. Mo put out a 275,000 bet and Hatings moved all in. Mo tanked for a bit and opted to lay this one down. Brian Hastings is up to 4.020 million with two lammers behind while Jason Mo has just 1.1 million left without the option to rebuy. Get Ready For The Final Day of Heads Up Action!